By Jean Legault - Geotech Ltd., Shengkai Zhao - Geotech Ltd., Nasreddine Bournas - Geotech Ltd., Geoffrey Plastow - Geotech Ltd., Gillian Keavell - Newstrike Capital Inc.
As presented at SEG 2015, KEGS-PDAC 2014. ZTEM™ helicopter electromagnetic and aeromagnetic surveys were flown for epithermal gold and gold-skarn targets on the Aurea Norte Property in the Guerrero Gold Belt. 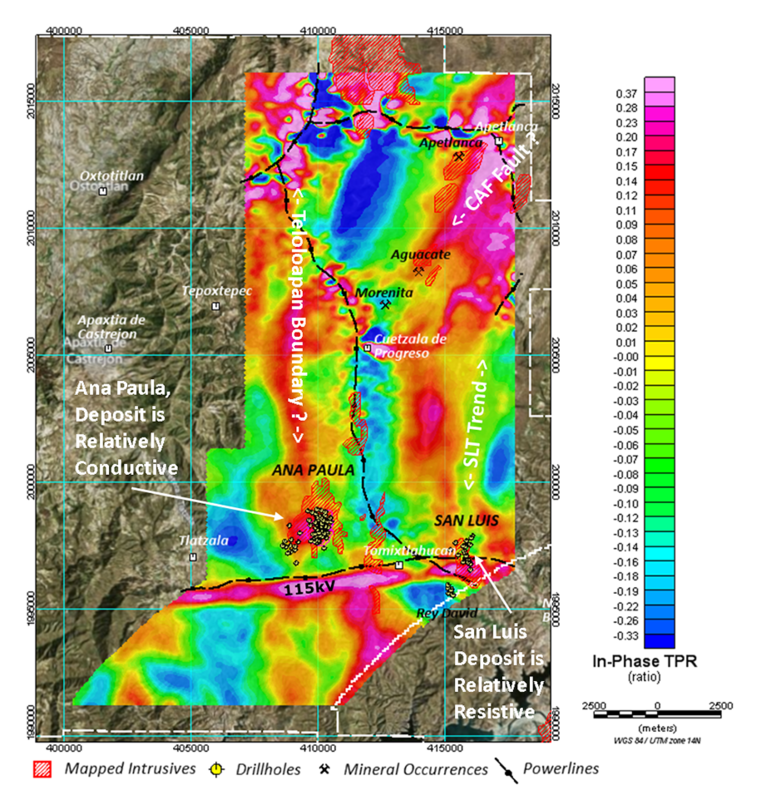 Survey results supported by 2D-3D EM and magnetic inversions indicate that the Ana Paula mafic intrusive hosted epithermal style gold deposit features high magnetics and low resistivity at depth; whereas San Luis oxidized skarn-style deposit hosts weak magnetics with high resistivity at depth. Both trends appear to be influenced by NS regional structural controls. 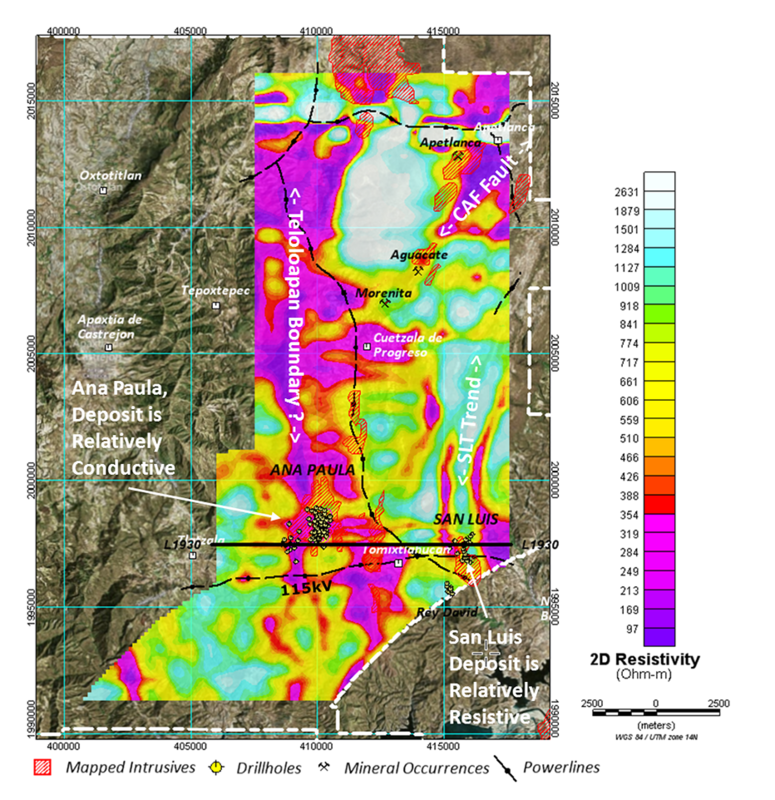 In May, 2013, helicopter-borne AFMAG (ZTEM™ z-axis tipper electromagnetic; Lo and Zang, 2008) and aeromagnetic geophysical surveys were undertaken for epithermal gold and gold-skarn targets over the Aurea Norte Property and situated at the northwestern edge of the Guerrero Gold Belt, near the town of Cuetzala del Progreso, in Guerrero State, north of Acapulco City, Mexico (Figure 1). The Guerrero Gold Belt (GGB) is a newly established gold mining district that extends for at least 55 km from southeast to northwest and has an inventory >30 million ounces of gold that originated in a skarn porphyry mineralizing event. 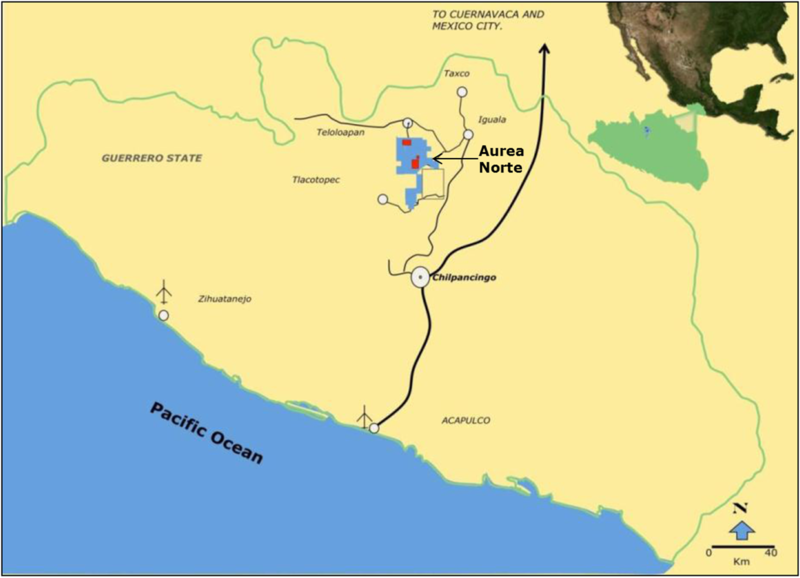 Figure 1: Location of the Aurea Norte Project, Guerrero State, Mexico (after Welhener et al., 2013). 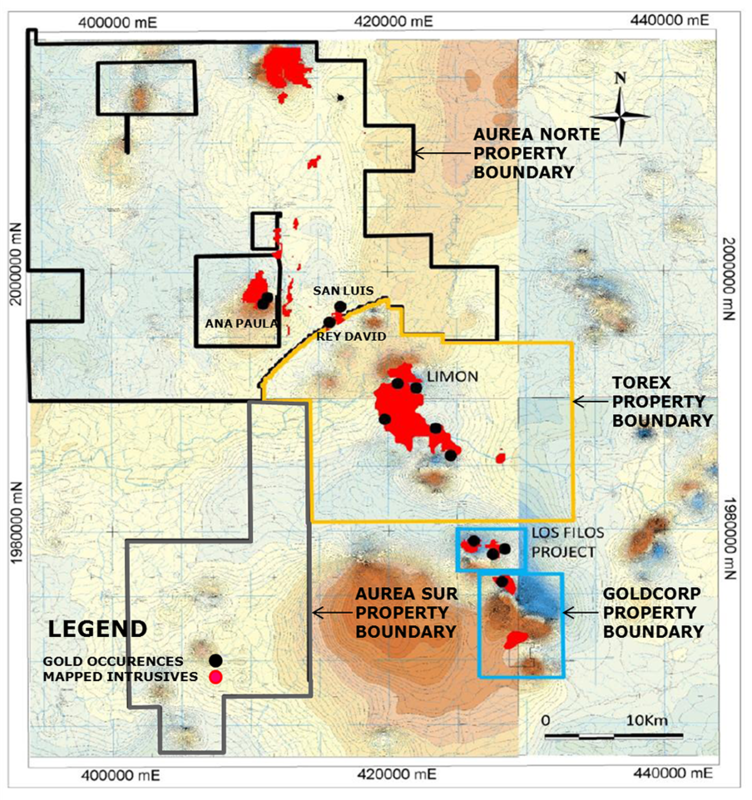 The Aurea Norte Property surrounds the Ana Paula Project host to a northerly trending structurally controlled low sulphidation epithermal style gold deposit that has a pit constrained resource of 44.8 million tonnes that includes 2.25 million ounces of contained gold and 10.8 million ounces of contained silver (Welhener et al., 2013). The San Luis prospect is an oxidized Au skarn style exploration target that lies along the 10km long San Luis Trend, a parallel trend located immediately east of the Ana Paul Trend. Both mineralized trends feature contrasting highly magnetic and also non-magnetic responses from the associated magnetite-pyrrhotite mineralization and mafic-intermediate intrusions. Magnetic surveys have historically proven to be useful tools for mapping epithermal gold and porphyry deposits (Hoschke, 2011; Williams, 1997), as well as mafic intrusive-hosted and associated skarn mineralization, regionally. However, magnetic responses are typically weak over some of the more mafic-poor, oxidized intrusive-hosted skarn deposits, locally. If similar deposits occur on the property or become buried, these may not be easily visible by their magnetic signature. The hope is that these might be defined by their resistivity signatures, more easily obtained from airborne EM surveys such as ZTEM™ AFMAG (Ward, 1959; Labson et al., 1985), as shown in case studies for epithermal gold and CRD-hosted gold deposits by Witherly (2011), Robertson (2011) and Legault et al. (2012). The ZTEM™ survey tested this hypothesis over the eastern portion of the Aurea Norte Property that included the Ana Paula and San Luis mineralized trends. The Aurea Norte Property is situated at the proposed boundary between two tectono-stratigraphic terrains: the Teloloapan volcano-sedimentary sequence to the west and the Guerrero-Morelos Platform sediments to the east. A discussion of the nature of the contact between the two sub-terrains is not within the scope of this paper. However, both are thought to have been highly deformed during the Laramide Compressional Orogeny and share a common basement in the Guerrero terrain. The property geology at Aurea Norte, shown in Figure 2, is mapped at a reconnaissance scale and, except over exploration targets; the structural and stratigraphic details are poorly known (Lunceford, 2009). Teloloapan volcanic rocks of Jurassic-Cretaceous age are the oldest stratigraphic units to outcrop on a property scale and are found in the southwestern half of the property (Figure 2). They consist of mafic flows, breccias and pyroclastics, with intercalated felsic tuff and marine sediments. 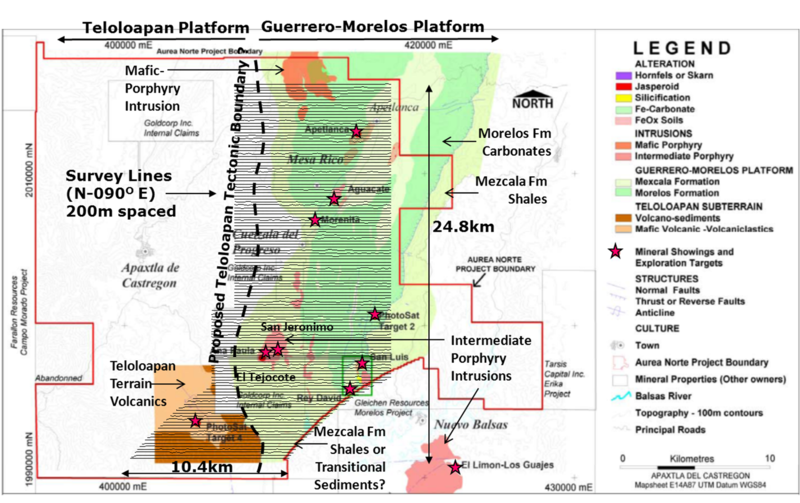 The younger Guerrero-Morelos Platform sediments occupy most of the eastern half of ZTEM™ survey area. They mainly consist of an early to mid-Cretaceous carbonate sequence of limestone and dolomite of the Morelos Formation that is overlain by younger Cretaceous flysch-type calcareous shale, siltstone and sandstone of the Mezcala Formation (Lunceford, 2009). Figure 2: Flight path of ZTEM airborne survey overlaying regional geology at Aurea Norte (after Lunceford, 2009). A younger Cretaceous to Early Tertiary age (62-66Ma) calc-alkali intrusion complex was emplaced into the local stratigraphy in an event related to the Laramide Orogeny and the gold skarns and breccias GGB mineralizing event. The intrusions consist primarily of mafic to intermediate porphyritic granodiorite and monzodiorite (Figure 2) that present “blind” exploration targets, lying mainly buried under the sedimentary cover. A second, low sulphidation epithermal gold mineralization overprints the GGB mineralization and is related to a younger intrusive event ~30Ma (Lunceford, 2009). Aurea Norte lies along trend of several rich gold-skarn deposits in the GGB, including the producing Los Filos Mines that include the Nukay, Los Filos, Bermejal and 4P deposits and the nearby development stage Morelos Project, which includes the Limon-Guajes and Cerro Media Luna deposits, all located south-east of Aurea Norte (Figure 3). Skarn-hosted gold mineralization is developed along the contacts of the intrusive rocks, and the enclosing carbonate-rich sedimentary rocks. Existing deposits and prospects on the Ana Paula Project that are internal to Aurea Norte include the San Jeronimo and El Tejocote deposits (Figure 2). Known prospects on the Aurea Norte Property include the nearby San Luis and Rey David mineral showings that lie to the east of Ana Paula, as well as the Morenita, Aguacate and Apetlanca prospects (Figures 2-3) that lie to the northeast (Lunceford, 2009). Figure 3: Composite of SGM total magnetic intensity (TMI) maps with overlay of intrusions and gold occurrences along the northwest trend of the GGB (after Lunceford, 2010). Prior to 2004, when exploration began at Aurea Norte, regional fixed-wing magnetic surveys by the Servicio Geologico Mexicano (SGM) had been flown over the area, in the 1970-80’s, at 1km line spacings (Lunceford, 2010). From these and later surveys, a series of magnetic anomalies highlighted a northwest axis of intrusions, now known as the GGB (Figure 3). Detailed aeromagnetics and radiometrics (K, Th, U) were flown at 100m spacings in 2005, over the southern half of Aurea Norte; and ground geophysical follow-up included 3D induced polarization over the San Jeronimo zone at Ana Paula, in 2007. Most recently, helicopter magnetic gradiometry was flown at 100m spacings in 2011 over the northern portion of Aurea Norte (Prikhodko and Kwan, 2011, Geotech Ltd., internal report). This was subsequently followed by a ZTEM™ helicopter AFMAG and aeromagnetic survey, in May-June, 2013 (Legault et al., 2013, Geotech Ltd., internal report). The survey consisted of 1350 line-km flown over a 268 km2 area, along 200m spaced east-west flight lines (Figure 2). Tipper EM data were obtained at 30-720Hz at a ~150m nominal sensor height The objectives of the ZTEM™ survey were to determine the resistivity signatures of the known mineralized zones and to identify other, potentially more deeply buried or non-magnetic epithermal gold and skarn deposits on the property. Figure 4 presents a colour shaded image of the reduced-to-pole (RTP) total magnetic intensity (TMI) over Area Norte survey area. The RTP highlights prominent magnetic highs that are centered on most of the known intrusions, gold deposits and prospects, including stronger magnetism (>150nT) over the Ana Paula deposit, possibly indicative of weak or oxidized pyrrhotite-pyrite-magnetite (po-py-mt) or the mafic-intermediate intrusion itself. Numerous small, unexplained weak to moderate (>10-30nT) magnetic highs, found mainly in the south, might indicate other po-py-mt-rich skarn occurrences or possibly man-made metallic structures, for the smaller magnetic features. Conversely, the nearby San Luis and Rey David showings are relatively weakly magnetic (<10nT), which is more indicative of intermediate intrusive host rocks. Figure 5 presents the ZTEM™ tipper results in plan shown as Total Phase Rotation (TPR) images that convert the tipper cross-overs into peak responses while preserving long waveform information (Lo et al., 2009). Shown is the In-Phase TPR at 90Hz, a middle frequency/medium depth, based on relative skin depth. In the 90Hz image, a mix of NS and NE-SW linear conductive trends are highlighted, with a prominent NS-conductive features extending through Ana Paula in particular. Narrower, linear NE trending conductors extend across/adjacent to Aguacate and Apetlanca occurrences. In contrast, the San Luis, Rey David and Morenita occurrences appear to be centred on resistivity highs, which might reflect the presence of silica-alteration or the intermediate porphyry intrusive host rocks. A north-south resistivity high trend that follows the north-south valley through the town of Cuetzala suggest that valley fill is relatively thin and the region is underlain by buried, intermediate intrusive stocks or thicker units of Morelos carbonate sediments. A prominent east-west conductive trend just south of Ana Paula is due to a major 115kV powerline; local powerlines elsewhere on the property impart higher noise that disrupts the ZTEM™ data as shown. (Figures 5-6-7). Two-dimensional (2D) and 3D inversions were performed on the ZTEM™ data using the Av2dTopo code (Legault et al., 2012) and UBC-GIF MT3Dinv code (Holtham and Oldenburg, 2008) converting the In-Phase and Quadrature ZTEM™ tipper data (30, 45, 90,180, 360, 720 Hz) into equivalent resistivity vs. depth distributions. The 2D inversion made use of only the in-line (east-west) Tzx data; whereas the 3D inversion utilized both in-line Tzx & cross-line (north-south) Tzy data. A 500 ohm-m homogeneous half-space starting model was chosen for both based on the model-data misfit testing method of Holtham and Oldenburg (2010). Three-dimensional inversions were also performed on the aeromagnetic data using the UBC-GIF Mag3D code (Li and Oldenburg, 1996). Figure 5: ZTEM Total Phase Rotation (TPR) of 90Hz In-Phase Tipper at Aurea Norte. Figure 6 presents a resistivity-depth slice, extracted from the 3D voxel volume obtained by combining the ZTEM™ 2D resistivity inversions. As shown, the depth slice contrasts the more resistive Morelos carbonate formations to the north and east, in relation to the less resistive Mezcala Fm/transitional sediments in the center-south and the more conductive Teloloapan volcanic rocks to the northwest. Visible inside these large lithologic resistive domains are major lineaments, such as the inferred, conductive NS-trending Teloloapan Boundary Fault (TBF), the conductive NE-SW Cuetzala-Apetlanca Fault (CAF) and the alternating conductive and resistive lineaments to the southeast that are likely Morelos Fm units. Finally, individual anomalies that are visible in the 3D resistivity volume include: 1) Ana Paula deposit is visible as a broad low resistivity zone along strike with TBF, and 2) San Luis is readily visible as a narrow NS-trending resistivity high, flanked by 2 similar conductive lineaments that extend north-northeastward along the San Luis Trend (SLT). Figure 7 compares 2D and 3D ZTEM™ inversion and 3D magnetic inversion results over an east-west survey profile L1940, whose location is shown in Figure 6. It features the Ana Paula epithermal gold deposit to the west and the San Luis skarn-hosted Au-occurrence to the east. 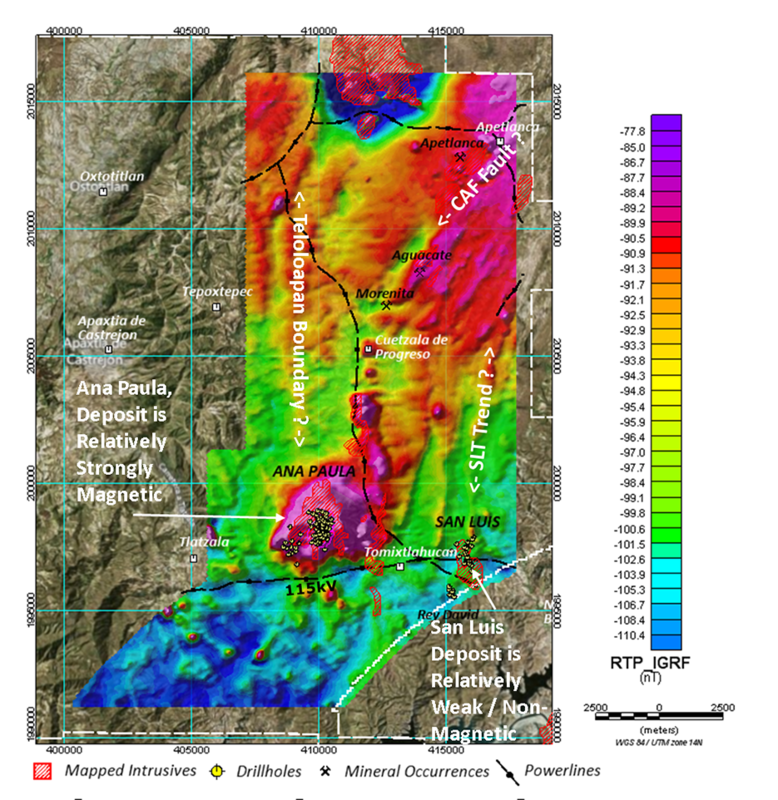 Ana Paula appears to correlate with a moderately conductive (100-200 ohm-m), <500m wide, steeply dipping feature in a magnetic low, within a larger mod-weak magnetic high, which is consistent with magnetite-depleted or clay-altered or brecciated zone. It partially subcrops and extends below 250-1km depths. One km further east, a larger, deeper, more conductive feature in the 2D inversion is shallower and narrower in the 3D image, but shown to also extend to >2km. This suggests a major altered or faulted structure in a deep magnetite-altered and/or mafic intrusion, possibly a major structural control such as the TBF. Further east, the San Luis gold showing coincides with a weak to non-magnetic and partially buried resistivity high feature that increases in size/width with depth and extends to below 2km. This response is consistent with a buried/ hidden, Si/K-altered and oxidized skarn or else a more felsic/silica rich unit. It is flanked by two resistivity lows, one of which is more weakly conductive, magnetic and lies partially buried (<200m), extending to >750m depths. It could be ascribed to a zone of skarn-type po-py-Mag mineralization or clay alteration or possibly a breccia or else a shale horizon. 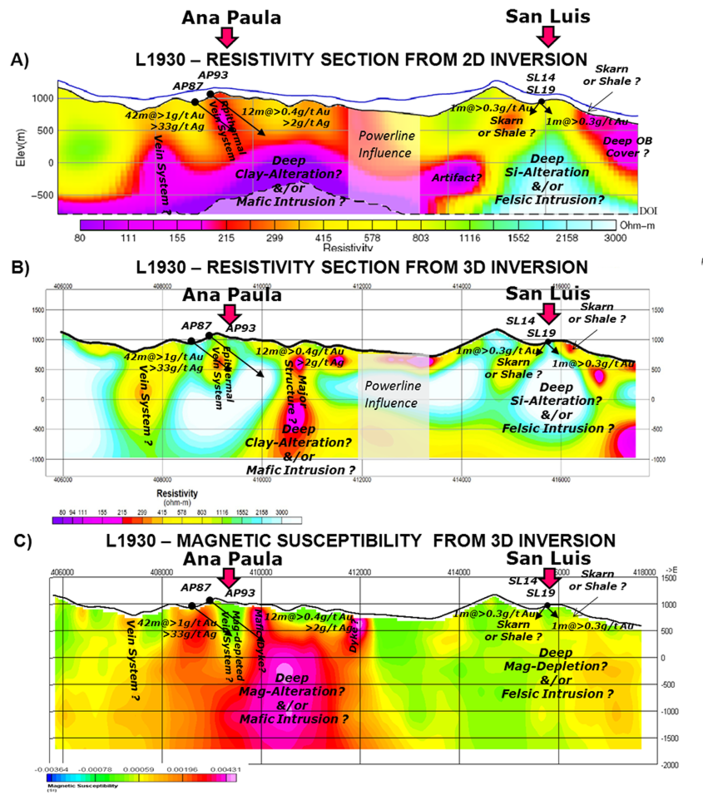 Figure 7: 2D-3D inversion results across Ana Paula and San Luis gold deposits 7a) Resistivity section from ZTEM 2D inversion, 7b) Resistivity section from 3D ZTEM inversion, and 7c) Magnetic susceptibility section from 3D inversion. Line location in Fig. 6. The aeromagnetic survey results have reconfirmed that most, but not all, the known gold deposits, such as Ana Paula, coincide with magnetic highs from the related mafic rich intrusive-hosted po-py-mt mineralization. But some Au skarns, such as San Luis, feature weak magnetic signatures due to the K-/Si-altered, oxidized mineralization in mafic-poor intermediate intrusive host-rocks. Yet the skarn mineralization still contrasts favourably with the surrounding granitoid intrusions and sediments because these are relatively non-magnetic and the zone subcrops. However, if other similar oxidized deposits occur on the property and become buried, these more weakly magnetic bodies may not be easily visible. The hope therefore is that these buried deposits might also be defined by their resistivity signatures. The airborne geophysical results presented here suggest that this is the case. The ZTEM™ surveys have defined both conductive and resistive signatures over the known gold occurrences that potentially reflect contrasting styles of mineralization and alteration. The Ana Paula epithermal gold deposit features narrow subvertical conductive and magnetic low signatures within a larger magnetic high that is related to the intrusive host and that suggest either brecciated or clay-altered &/or magnetic depleted zones that are consistent with known epithermal gold deposits (i.e., Hoschke, 2011; Williams, 1997). Ana Paula also occurs along a well-defined, major NS conductive lineament that is buried and has a >10km strike length, extending further northward – possibly the inferred Teloloapan Boundary Fault (TBF). It suggests a major structural control to the deposit that is distinct from the mafic intrusive host. The San Luis Au-skarn deposit features a subcropping resistive and weak to non-magnetic signature that opens at depth and strengthens in intensity -consistent with the oxidized skarn mineralized, silica- altered intermediate intrusive host. San Luis lies along a resistive trend between two well-defined, major NS to NNE conductive lineaments that extend >5km northeast, forming the San Luis Trend (SLT). These might represent structural controls to the intrusive related skarn mineralization or else possibly shale formations. Holtham, E., and D.W. Oldenburg, 2008, Three-dimensional forward modelling and inversion of Z-TEM data: SEG, Expanded Abstracts, 27, 564-568. Holtham, E., and D.W. Oldenburg, 2010, Three-dimensional inversion of ZTEM data, Geophysical Journal International, 182, 168-182. Hoschke, T., 2011, Geophysical signatures of copper-gold porphyry and epithermal gold deposits, and implications for exploration: Published by CODES – ARC Center of Excellence in Ore Deposits, University of Tazmania. Labson, V. F., A. Becker, H.F. Morrison, and U. Conti, 1985, Geophysical exploration with audio frequency natural magnetic fields: Geophysics, 50, 656-664. Legault, J.M., S. Zhao and R. Fitch, ZTEM airborne AFMAG survey results over low sulphidation epithermal gold-silver vein systems at Gold Springs, south eastern Nevada: ASEG, Extended Abstracts, 4 p.
Li, Y., and Oldenburg, D.W., 1996, 3-D inversion of magnetic data: Geophysics, 61, 394-408. Lo, B., and M. Zang, 2008, Numerical modeling of Z-TEM (airborne AFMAG) responses to guide exploration strategies: SEG Expanded Abstracts, 27, 1098-1101. Lunceford, R.A., 2009, Geological report and summary of field examinations, Aurea Norte Project, Guerrero State, Mexico: NI 43-101 report for Newstrike Capital Inc., 110 p.
Lunceford, R.A., 2010, Geological report and summary of field examinations, Ana Paula Project, Guerrero State, Mexico: NI 43-101 report for Newstrike Capital Inc., 90 p.
Robertson, K., 2011, The 2009 Pozo Seco Molybdenum Gold Discovery: Presented at KEGS Canadian Exploration Geophysicist Society Symposium, PDAC. Ward, S. H., 1959, AFMAG – Airborne and Ground: Geophysics, 24, 761-787. Welhener, H.E, R.A. Lunceford, and A.H. Winckers, 2013, Ana Paula Project Technical Report and Initial Resource Estimate, Municipalities of Cuetzala Del Progreso and Apaxtla del Castregon, Guerrero State, Mexico: NI 43-101 report for Newstrike Capital Inc., 151 p.
Williams, P.K., 1997, Towards a multidisciplinary integrated exploration process for gold discovery, in A.G. Gubins, ed., Proceedings of Exploration 97: Fourth Decennial International Conference on Mineral Exploration, 1015–1028. Witherly, K., 2011, ZTEM: A new paradigm in airborne EM: Presented at 79TH Annual Meeting of Prospectors and Developers Association of Canada, PDAC, CAMESE Exhibitor Innovation Forum.